The fake account scandal at Wells Fargo has done real damage to the bank's stock price. Wells Fargo (WFC) stock closed below $45 on Monday for the first time since February 2014. 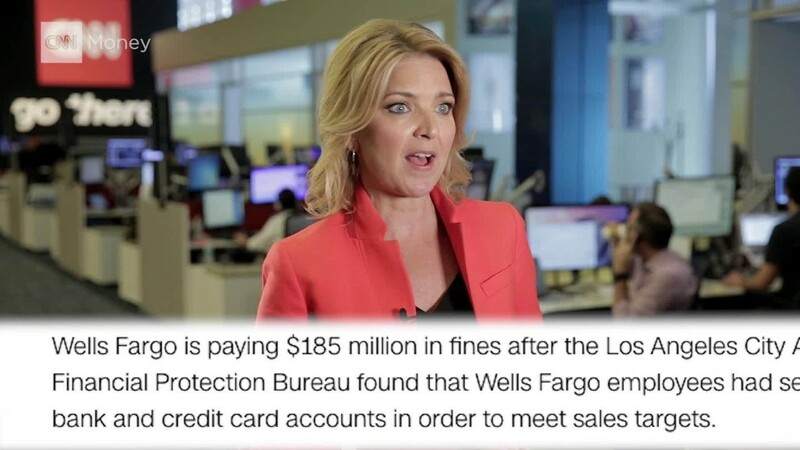 It's now down 10% since Wells Fargo was slapped with a $185 million fine for creating as many as 2 million fake bank and credit card accounts. Wall Street is worried that the scandal is causing reputational and financial harm to Wells Fargo. The 31-month low for Wells Fargo stock is likely to push more people to call on the company to replace longtime CEO John Stumpf. Mike Mayo, an influential bank analyst at CSLA, said in a new report on Monday that his support for Stumpf is "now wavering" and hinges on the CEO's ability to "contain reputational damage from the cross-selling fiasco." He said Stumpf should cut his own compensation this year, detail clawbacks for other key executives and the Wells Fargo board should consider separating the dual titles of CEO and chairman that Stumpf currently holds. Wells Fargo faces obstacles on many fronts: the Department of Justice has launched an investigation, two Congressional committees have called hearings and angry customers have filed a lawsuit. And now, Wells Fargo employees who say they were wrongfully terminated have filed a federal class action lawsuit. Mayo noted Stumpf's shaky performance at last week's Senate hearing, where the Wells Fargo boss was slammed by lawmakers on both sides of the aisle -- especially Democrat Elizabeth Warren. That raises the stakes for the upcoming Wells Fargo hearing in the House on Thursday. "There should be no more excuses for the lack of answers to key questions," Mayo said. Wells Fargo now finds itself in the unusual position of trailing its banking peers. Recently Wells also lost its spot atop the list of America's most valuable banks to rival JPMorgan Chase (JPM). 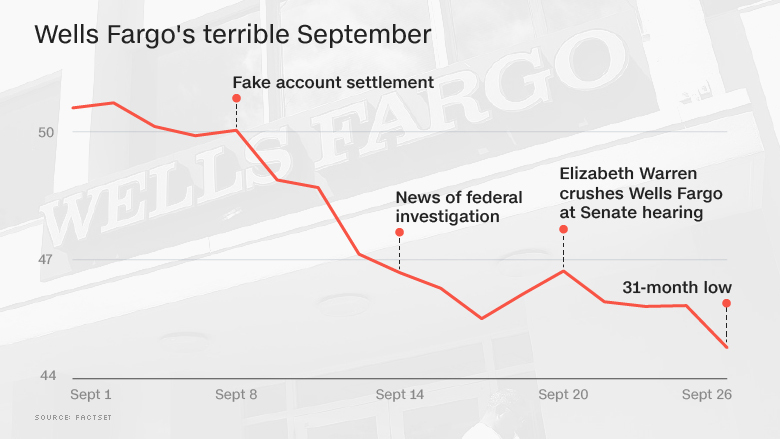 Wells Fargo shares are down 10% since September 7, the day before the fake account settlement. However, the KBW Bank Index (BKX) is only down 3% over that span. That's a reversal for Wells Fargo, which weathered the 2008 financial crisis better than its peers. Wells Fargo stock was up 26% between June 2007 and last week, compared with a 39% plunge for the KBW Bank Index.